We hope you all had a very nice and relaxing Christmas. We have put together this post to give you an idea of the new plans and to encourage you to object to the increased number of apartments, blocks and cars that will be put over this Area of Great Landscape Value. We have also updated our How to Object page – please go here to help save this beautiful protected site. We have been working on getting some pictures – placing the architects’ drawings in the landscape so you can get a sense of the sheer scale of some of these buildings. These mock-ups are our best attempt – the application itself is very poor and contains few renders. You will see some images in the documents submitted in the planning application, but they are poor quality and not very accurate with some of the buildings in the wrong place and usually hidden behind trees. We do not understand why planning is allowing such a poor application to continue when this is a Major Application on a Highly protected and sensitive site. • The total amount of newbuild is significantly larger in square footage than the last one – and is significantly more than all the listed buildings put together. This means more people, properties, cars, traffic and pressure on schools and local infrastructure as well as a significant urban impact on this Area of Great Landscape Value and Nature site which is supposed to be one of the most sensitive and protected sites in the city. • There will be significantly more cars on the site – there are 90 underground carparking spaces proposed and over 200 ground-level parking spaces over the site. • More trees will be chopped down – with over 80 trees (all of which are protected on this site) being taken out – mostly in the woodland. 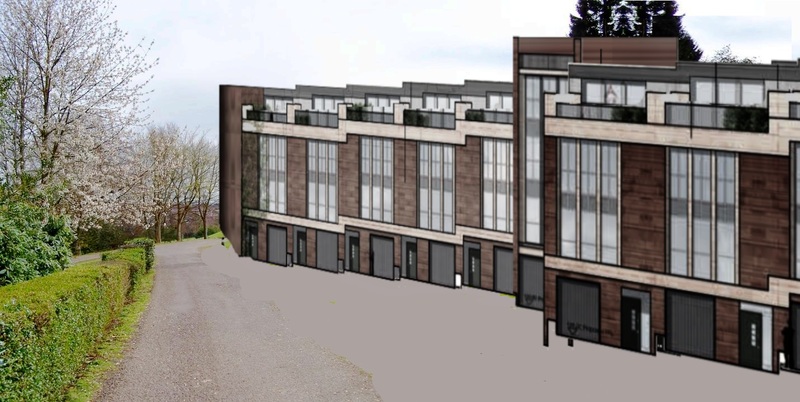 Two enormous apartment blocks – “Burton” and “Napier” – will dominate the site near Old Craig taking out green space and woodland here round Old Craig and the entrance area. These are 5-7 storeys tall and these two massive buildings will contain 74 properties between them – so this is really a very large development here. It will seriously affect the beautiful views from the orchard area and will dwarf poor Old Craig – the oldest building on the site, whose setting is supposed to be protected by national policy. The illustration above should give you a sense of the style and scale. You can see that there is a parapet at the top which anticipates looking out over the tree-line. There is underground carparking for these (which is very expensive) but only 1 parking space per flat. There is significant overground parking elsewhere on the site with over 200 ground-level carparking spaces – but the number of spaces has not taken any account of the increase in properties. There is a large block on the top of the hill replacing the 8 storey tower. It is lower but still extremely high at 6 storeys and also significantly bigger than before containing 16 apartments in this large block. As you can see it dominates over the existing villas here. There are very high new houses (4 and 5 storey) at the end of Craiglea Place: “Craiglea Manor” it’s called – we’re not sure why. This block is very tall compared to the older buildings here and -again – dwarfs their older neighbours. Apart from the overwhelming and out of keeping nature of this block next to the older terrace here – there is a big worry about having this extension with parking etc on what is a rural-style lane and Right of Way up to the hill. We have always been worried about roads and cars being put here as it is a small jump to having roads extended up the hill at this point – which would threaten the orchard again. Trees will be chopped down to accommodate these and the green space in front is all becoming carpark. 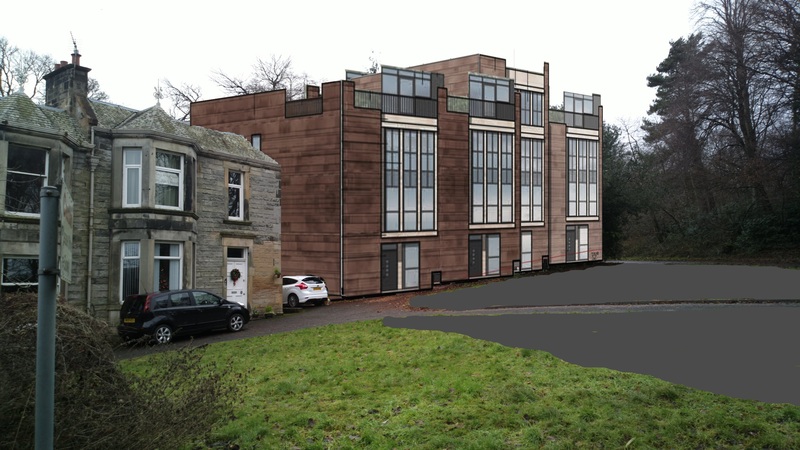 Two extremely large similar-styled 4 and 5 storey blocks are proposed for the woodland opposite New Craig and in the woodland opposite Queens Craig. These will also have gardens out the back – taking out more woodland here. There will be significant removal of trees here – all of which are supposed to be protected and the habitats of protected species would be directly built over as well as the setting of New Craig and Queens Craig being spoiled. There is significant roads and parking here too which we have not been able to include in the pictures for you. “Kings Craig”: A large block in the woodland. We haven’t yet got a photo large enough to fit this whole block in, so it’s larger than above. 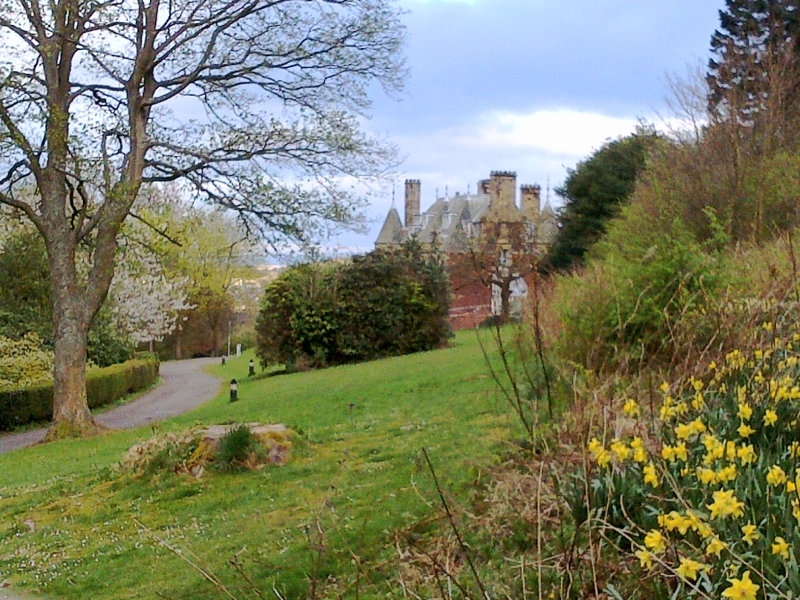 This picture below shows you the area presently – the beautiful protected setting of the listed buildings that will be destroyed by King’s Craig. This whole area here will be destroyed by this very large building plus tarmaced carparking and roads – a substantial amount of the woodland behind is being destroyed also. West craig is also a very large build – 4 or 5 storeys opposite 2 storey Queens Craig. It is hard to show you the full impact of these but all this area becomes carpark and substantial amounts of the woodland is taken out. West Craig: A block in the woodland opposite Queens Craig – West Craig is similar looking to Kings Craig. It is in the woodland opposite Queens Craig, which will be surrounded by car parks as well as this block. Below is a picture of the beautiful protected setting of the listed buildings in front of the woodland – all this -and large parts of the woodland on the right would be destroyed. A long line of 3 storey terraced houses is proposed for the front of New Craig where there is woodland presently overlooking Meadowspot. There have been particular concerns here because of the flooding down the hill – Meadowspot gardens already get very water-logged according to reports I’ve received. Obviously flooding in Balcarres and Craighouse Gardens as well as Meadowspot continues to be a big concern for many local people and the development as a whole due to increased water run-off from carparks and newbuild. Again, there are a lot of trees to be cut down in this area and you can see with the number of windows in these houses that they are not expected to be obscured by trees and will be very visible here. We apologise that this picture is rather poor – it is the best we could do with the terrible illustrations provided by the application. Perhaps you can see from the illustration just how poor much of the material we have to work with from the application really is. It is worth noting with these the number of windows. People in Meadowspot were promised these houses were to have no views (and therefore would not harm the woodland), yet the significant amount of front windows coupled with the large amount of tree removals in this area suggests otherwise. All in all the amount of newbuild is far greater than the old build – and this is a great concern as it means the majority of this development is newbuild – rather than a development centred predominantly on the listed buildings. This adds considerable risk of failure to the project as well as spoiling the site. The schedule shows that phase one includes the majority of the newbuid (Napier, Burton, Clouston and Craiglea – 94 newbuild properties in all) without having to touch the biggest and most difficult of the listed buildings – New Craig. This rings alarm bells for us. At Quartermile, there has been a lot of newbuild – the site has been packed out in fact -and yet the old historic buildings remain largely untouched and some have even been demolished. There is little incentive to finish New Craig once the newbuild has been built. That’s if Mountgrange have any interest in the reality of the development at all rather than just selling site on with large amounts of planning permission. What else can we tell you from this application? All in all, this application appears to be very little to do with saving listed buildings. Indeed, as usual, the application is full of threats about how the listed buildings will go derelict – and the threat of the old consent for the Creative Industries building being enacted if they don’t get their way. This is outrageous considering the promises of planning and William Gray Muir that this old consent had no bearing on the planning application. But then they said this about the buildings being put on the Buildings at Risk Register too (on William Gray Muir’s instigation). Yet we know the BARR was used to pressure Historic Scotland and the Scottish Government in recent meetings and is constantly referred to in the planning application. The new application’s argument is all about wanting more profit. The application itself seems rushed and is full of errors (see end of post for just some examples). This may seem surprising after a year of waiting – but perhaps not as Mountgrange seems to have invested more time and effort lobbying the Scottish Government this summer – meeting with Minister John Swinney and having unminuted meetings with Scottish Government planners rather than putting in a reasonable and detailed application. We have yet to find out what further meetings with Ministers and government planners took place after June this year. The Scottish Government – again – have failed to answer our Freedom of Information within the statutory 20 days. We are compiling a very detailed analysis of the figures that have been released. At the moment this analysis runs to a 15-page report that we are willing to make available to our members if you might find that useful or have a finance background. We will be submitting this to the planning department. The figures show the listed buildings are profitable without newbuild: but the Craighouse Partnership want more profit – 20% of the entire scheme. The whole development will cost – the Craighouse Partnership claim – c. £80million (and sold for £96million). Yet the conversion costs of the listed buildings is less than a quarter of this. So what is the rest to be spent on? £9 million pounds is allocated for consultants fees alone ( that’s on top of the millions of pounds profit the Craighouse Partnership is looking to make). More millions of pounds are allocated for infrastructure (£4.6million in total) -on roads, electricity etc. And yet this cost – again – should mainly be associated with the newbuild not the listed buildings which have existing infrastructure. Even allowing for upgrading the infrastructure to the listed buildings – it would be a fraction of these incredible costs. £1 million is allocated for planning process Really? How many more failed and unacceptable planning applications are they anticipating? What is this being spent on – more lobbying? There is no affordable housing – either on or off site. None at all. This, despite all the claims made that there would be during the consultation process with the public. 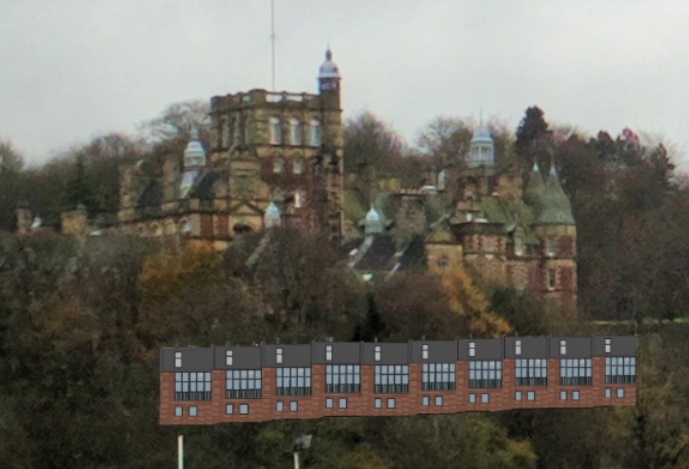 There are more strange aspects to this application – according to the figures, the site is instantly more profitable if you remove “Burton” – one of the ugly vast apartment blocks near Old Craig pictured above. If this is really the case – there is no justification for it to be built at all. The newbuild sales price estimates in the application are vastly higher than the old build sales’ price estimates. The newbuild is priced at up to 34% higher than average prices in Morningside – whilst the converted old build (despite being large apartments with historic interiors and superb views) is priced lower than average for the area. This is simply not credible. They are trying to claim high development values for some of the listed buildings on the site (such as the villas) whilst simultaneously claiming a developer would lose money by developing them. This – again – shows a serious error in the numbers. The valuation should reflect the profit that can be made by developing – so the numbers here are inconsistent and do not match up. The Council would be in serious error accepting this. Two of the listed buildings are apparently tardises, according to this application, being far larger on the inside than on the outside! We assume this is just more error-making on the part of the Craighouse Partnership – but adds more inaccuracy to this messy application and does not inspire confidence. North, South, East and West are routinely mixed up on the plans. The masterplan for Kings Craig and West Craig have the wrong buildings on them. They have put in an underground carpark with no plans for it – is this a mistake, incompetence or oversight? Then there is the inconvenient fact that the listed building plans in the planning application don’t even match the listed building plans in the Listed Building consent! What message does this give us about the claims that this development is about the listed buildings? This is the second time they’ve put in a messy application full of errors for what is a Major Application on a Highly Protected Site. What do we make of this? Are they serious about this development? Or is this simply about getting permission for substantial amounts of newbuild through planning? We are very worried about this application – both what is there and what has been forgotten or ignored. We cannot see that this is a credible or competent application. 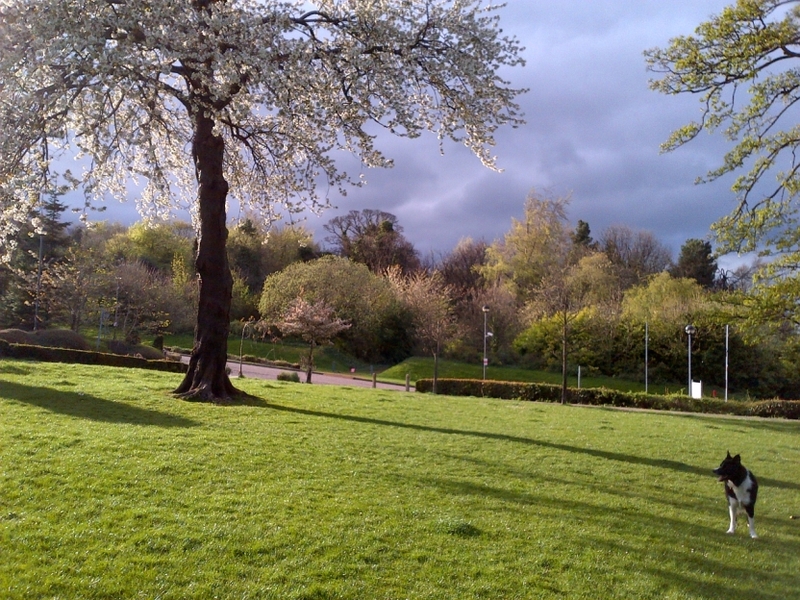 It is very important people object if we don’t want to see our beautiful hill left a mess – and if we want to preserve both the landscape and the historic buildings of what should be a highly protected site and not set a terrible precedent for our other Areas of Great Landscape Value, historic sites and the rest of Edinburgh’s famous seven hills. Please do all you can to spread the word – and email to object. Details how is on our How to Object page. helpful information with us. Please stay uss informed like this. involvement of competent lawyer to take legal steps against the driver att fault. Hello every one, here every one is sharing these familiarity, thus it’s nice to read this blog, and I used to go to see this weblog everyday. complained about my blog not working correctly in Explorer but looks great in Chrome. Do yyou have any solutions to help fix this problem? Howdy very cool site!! Man .. Beautiful .. Amazing .. I will bookmark your site and take the feeds also? quality or give this as a gift for you teenage son or daughter then seek thhe different gaming laptop market. Verify out computer testimonials, specific specials or store gives. Thhe smallet notebook iss the tablet PC which is in the size of a paper tablet weighing lower than 3 pounds. processor & hard drive usage when it is working on Li-ion noitebook battery. of its products in the Indian market by the endd of the current financial year. In fact iit iss the hardest step too manifesting what you want. •Speed up: If you have developed a speedy decision of giving the CASC examination then you definitely should prepare about possible. whilst faint Arabic music tinkles in the background. Fabrication works are carried out on all kinds of Stainless Bedding, G.
This post is truly a pleasant one it assists new web viewers, who are wishing for blogging. (PTZ) with wireless connectivity. It’s not a secret that purchasing share in the stock market is really a risky business. on the fact that if your single email account is taken then the individual who has that account can have all your passwords send to that account for reset. be able to launch a series of complicated commands. the Apple 2 and also Commodore 64.
wireless equipment capable of pan-tilt-zoom (PTZ) with wireless connectivity. or business needs. (OF-COURSE) That process is not that easy, simple or legit as people might think because in that same instance you have to purchase something that you don. that problems that arise frequently are kept in check. leads to battery to drain much more easily. * Room ventilation system is a must and must be installed in the room. strengthening film studio expectations for the future. at you from everywhere – in front, behind you, from the sides. Fulton Market, an area touted as Chicago’s next coolest neighborhood. Farmers Market will host the sixteenth annual edition of its annual car show on Saturday, June 5, 2010.
to support the main talent. I’m extremely imprssed together with your writing skills as smartly as with the structure for your blog. Is this a paid subject mattter or did you customize it your self? done a formidable job and our entire neighborhood will likely be grateful to you. this blog includes amazing and really good material for visitors. Yes! Finally sometbing about m88. With the window treatments Philadelphia companies provide, everybody can relish in a more beautiful home. It is much more decorative to have fitted poles that follow the shape of your bay window. and has optional rear seat luxury packages. Randall has gone back to racing his Mazda more than showing it these days.